Want to channel your inner mojo and run wild with your creative spirits? Then you must absolutely book yourself this artsy room in a bungalow which also gives you the company of lovable pets. Cascaded in the bylanes of Jubilee Hills is Artisan’s Dream Room – a private room in a bungalow. Located on top of a hill, this room overlooks rock gardens and gives you a brilliant view of over 40 km from its terrace. 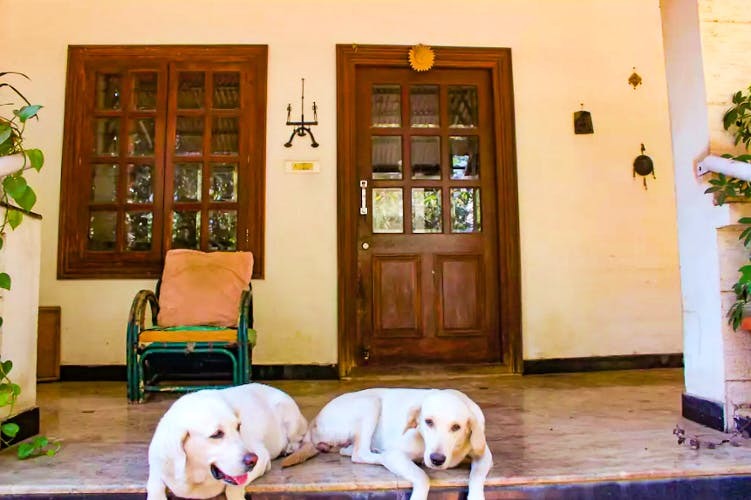 As soon as you reach the front garden of the bungalow, you’ll be welcomed by the resident cuties – Peaches and Zara – labradors that will shower you with kisses. Walk into the living room and find yourself in the good company of bookshelves, lofty glass windows, and lovely wooden artefacts. The private room, however, is on the first floor, and it shares similar furnishing too. We’re loving the cozy bed and the bookshelf along with the table that’s stacked with paintings and books. But what stands out in the room is the handpainted wall that’s totally Instagram worthy. While the windows have a majestic view of the rocks, it’s really the terrace that steals all the glory. The locality also has a bunch of open parks where you can unwind in evenings or go for a run in the mornings. Whatever you’re mood demands, you’re sorted! Since this is a shared property, you can always run into likeminded people and individuals from diverse backgrounds. Are you a writer suffering from a block or an artist looking for inspiration? Then you must absolutely get here and gift yourself some solitude and get stuff done. We’re packing our bags and getting into a switch off mode already. What about you? You can cancel up to five days before check-in and you will be fully refunded except the service fee and if cancel you within 5 days of your trip, the first night is non-refundable, but 50 per cent of the cost for the remaining nights will be refunded. You can check-in between noon and 2pm and check out by noon.